The was my second attempt creating Elmo bento for his lunch. The first time, I remembered, was a couple of years ago when my son was still crazy over the Sesame Street. I did it using cherry tomatoes. However, his taste changed later and rejected cherry tomatoes entirely till now. Hence, I stopped too, making more animals theme bentos instead. 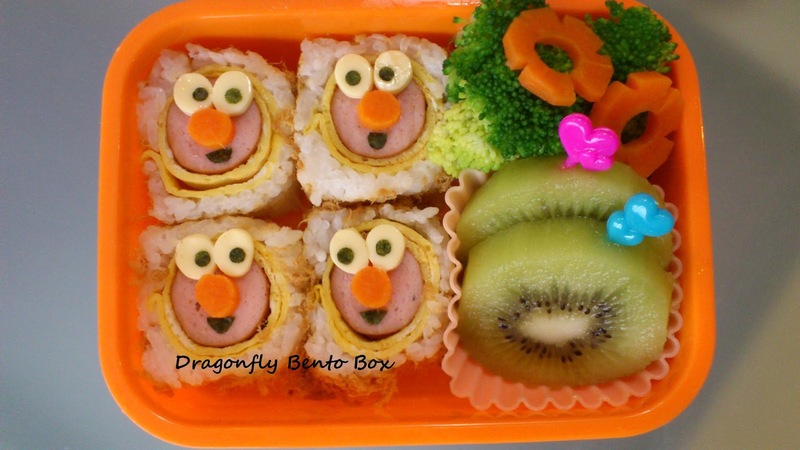 Inspired by bento bloggers, I made Elmo again using hotdogs rolled with omelette, rice and pork floss. :)) Facial details were cheese, carrots and seaweed. On the sides, my son has blanched broccoli/carrot and green kiwi. I only told my boy about the ingredients and kept him in the dark that it was Elmo theme charaben. He is not into cute cute stuff anymore. What he likes now is the food not charaben. Very honest of him to tell me so but I felt a little disappointed. Well, I may have more 'No frill Bento' style to share in my blog space next time.